← Our new pup, Cognac. 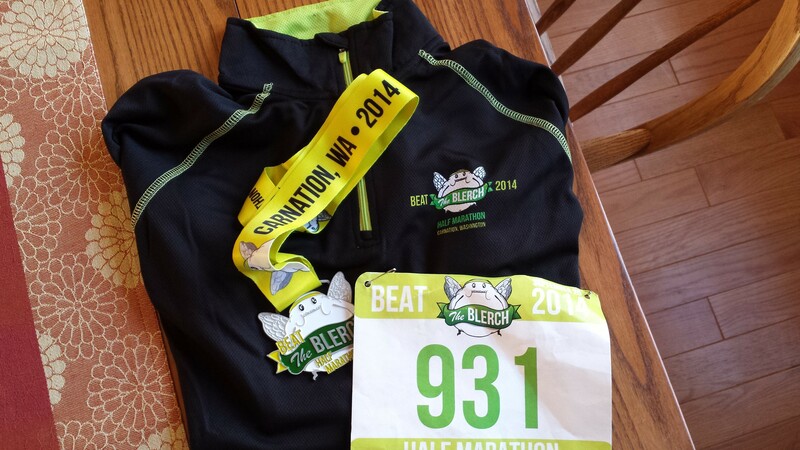 On Saturday, September 20th I ran my 19th Half Marathon, Beat the Blerch in Carnation. Carnation is the boonies, with cows, horses and farms. The website made it sound like parking was going to be crazy, so I got there at 8:10 for a 9:30 start time. I parked at the middle school which I didn’t realize was about a half mile from the start. There was no line at packet pick up or at the huge row of porta potties. I met the Half Fanatics for my first group picture then walked my stuff back to the car. I met up with Lindsey at the start line. We chatted a few minutes wished each other luck then it was time to race. Many people have raved about this race. I knew at the beginning I would not run this race again. 12 of the 13 miles were on a gravel trail. When you are used to running on pavement, gravel is not fun. I slowed my pace and tried to stay in the packed grooves. There would be no sub 2 today. Yes, there was cake and nutella sandwiches, which I did not have. I did take advantage of all 4 water stops. About 3 miles to the finish was the 10 K turn around and there were many people walking 3 and 4 wide. I was weaving in and out of many people for the last 3 miles, again not fun. I finished in 2:03. At the finish they gave you got your medal, no water. My biggest pet peeve about races in the PNW, give me a bottle of water with my medal. Do not make me stand in line for a cup of water. The line for the food was massive. I got some water and began walking to my car. This was just not the race for me. I do think the organizer’s had a fun atmosphere. 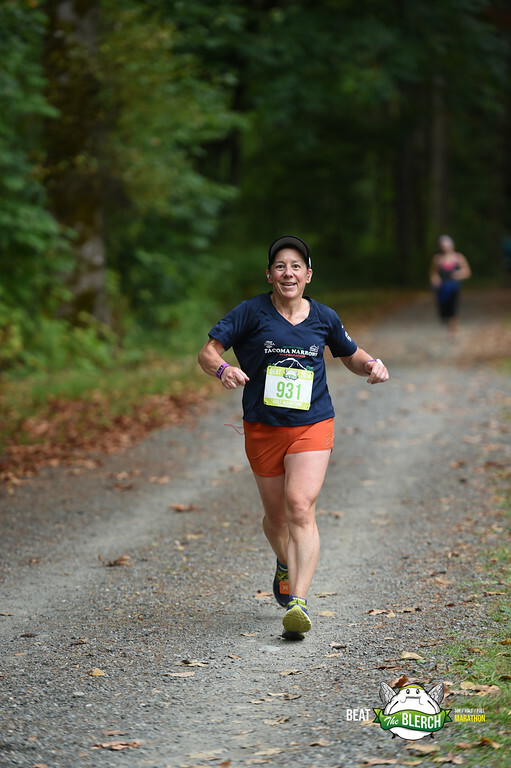 I loved the number of porta potties, the shirt, medal and free races pictures. Not a fan of the gravel, 10k walkers the last 3 miles, cups of water and massive line for a banana. This entry was posted in Uncategorized and tagged Beat the Blerch, half marathons, The Oatmeal. Bookmark the permalink.